The following article is an extended version of one that appeared on this site when it was first published in 1998. Although it is a little technical in parts, this information is intended for family members of children with speech sound disorders (SSD) who have questions about the classification, nature and treatment of these communication disorders. It may also appeal to SLP/SLT students and qualified clinicians wishing to direct their clients to a trustworthy web-based source. Copyright © 2011 Caroline Bowen All rights reserved. Bowen, C. (2011). Children's speech sound disorders. Retrieved from http://www.speech-language-therapy.com/ on [insert the date that you retrieved the file here]. Phonology is a branch of linguistics. It is concerned with the study of the sound systems of languages. The aims of phonology are to demonstrate the patterns of distinctive sound contrasts in a language, and to explain the ways speech sounds are organised and represented in the mind. The term ‘phonology’ is used as a referent to an individual’s speech sound system - for example, ‘her phonology’ might refer to ‘her phonological system’, or ‘her phonological development’. Clinical Linguistics is a branch of applied linguistics involving the application of linguistic theory to the field of Speech-Language Pathology / Speech and Language Therapy (SLP/SLT). Its purpose is the use of linguistics to describe, analyse, and treat communication disorders. Clinical Linguistics & Phonetics, the foremost research journal of the field, was founded by Martin J. Ball. Clinical Phonology is the aspect of Clinical Linguistics that covers the explanation and treatment of Speech Sound Disorders. Speech is the spoken medium of language. The other mediums or forms of language are reading, writing and gestures. Gestures range from simple iconic movements, like pretending to drink, through to complex finger-spelling and formal sign systems (sign language/signed language). What does speech development involve? phonotactic development (the ability to produce 'syllable shapes' and 'word shapes' such as CV, VC, CVC, CCV, VCC, CCVCC, etc. [C = consonant V = vowel]). Children also have to learn how to apply and regulate, when they speak, features such as word stress, timing of speech events and pause events, and prosodic features including rate, intonation, nasality, pitch and loudness. Intelligibility is the percentage of speech that a listener can understand (see Table 1), or the clarity of a speaker's utterances. 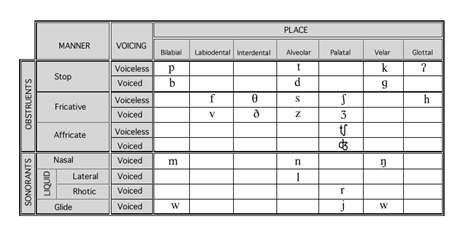 the phonological rules or phonological processes that ‘map’ between the two above. Map (-ping, -ped) is a term used to characterise a feature of model construction in scientific enquiry. It has been applied to several areas in linguistics and phonetics. Mapping refers to the correspondence between the elements defined in a model of a situation, and the elements recognised in the situation itself (Crystal, 1991). ‘Phonological process’ is the name sometimes applied to descriptions of developmental ‘error patterns’ or ‘speech simplifications’ found in the typical development of young children’s speech (See Table 2). Some clinicians and researchers prefer to use the term 'phonological pattern' when referring to these systematic errors. Phonetic development is the gradual acquisition of the ability to articulate speech sounds (e.g., /p/, /b/, /t/, etc.) and structures (e.g., consonant clusters such as /fl/ and /skw/). It is often referred to as articulation development (See Table 4). Articulation is a general term used in phonetics to denote the physiological movements involved in modifying the airflow, in the vocal tract above the larynx, to produce the various speech sounds. Sounds are classified according to their place and manner of articulation in the vocal mechanism (Crystal, 1991) and are often displayed on a consonant chart or place-voice manner chart. How clear should my child’s speech be? Table 1 provides a rough rule of thumb for how clearly your child should be speaking. Bear in mind that there is considerable individual variation between children. If you are in doubt about your own child's speech sound development an assessment by a speech-language pathologist/speech and language therapist will quickly tell you if your child is 'on track' and making the right combination of correct sounds and 'errors' for his or her age. Considering children from 18 to 48 months, Lynch, Brookshire & Fox (1980) reported age-norms for how intelligible a child is likely to be to his or her own parents, or in other words, how much of the child’s speech parents are likely to understand. According to this study, at 18 months parents understand only about 25% of their own child’s speech. This increases to 50-75% at 24 months and 75-100% by the child’s third birthday. By four years of age children should be 100% intelligible to parents and people outside the family (‘strangers’ who are unfamiliar with that child’s speech). Looking at children from 12 to 48 months, Flipsen Jr. (2006) developed a ‘formula’ to reflect expectations, in percentage terms, of how intelligibe a child’s speech will be to unfamiliar listeners. It was the child’s age in years divided by 4 and multiplied by 100 to get %-age of speech understood by strangers. What are the characteristics of young children's speech? All children make predictable pronunciation errors (not really 'errors' at all, when you stop to think about it) when they are learning to talk like adults. These 'errors' are sometimes called phonological processes, or phonological deviations, or phonological patterns. Table 2 displays the common phonological processes found in children's speech while they are learning the adult sound-system of English. By what ages are phonological processes typically eliminated? The phonological processes have usually 'gone' by the time a child is five years of age, though there is individual variation between children. Table 3 lists the ages by which each process is normally eliminated. It is important to think of the ages shown as ‘gone-by ages’ and not ‘normal-until ages’. What are articulation development and phonetic development? The terms 'articulation development' and 'phonetic development' both refer to children's gradual acquisition of the ability to produce individual speech sounds. In Table 4 is an outline the ages by which children in an Australian study (Kilminster & Laird, 1978) used individual consonants with 75% accuracy during conversation. Are phonological and phonetic development related? There is a complex relationship between phonological and phonetic development. Normal speech development involves learning both phonetic and phonological features. The bulk of recent research into children’s speech development has dealt with phonology: exploring and attempting to explain the process of the elaboration of speech output into a system of contrastive sound units. There has also been a considerable body of research into the acquisition of motor speech control, bringing with it a renewed interest in the nexus between phonological development and phonetic development. Do phonological and phonetic development synchronise? Phonological development and phonetic mastery do not synchronise precisely. A common example of the asynchrony between the two referred to by Smith (1973) as the puzzle phenomenon, is provided by children who realise (pronounce) /s/ and /z/ as 'th' sounds, while producing ‘th-words’ with [f] in place of voiceless 'th', and [d] or [v] in place of /ð/. For example, the child might say ‘thum’ for ‘sum’ and ‘fum’ for ‘thumb’ even though his or her production of ‘thum’ in place of ‘sum’ indicates that the child can actually produce the ‘th’ sound. A Speech Sound Disorder (SSD) involves difficulty with and/or slowness in the development of a child’s speech. The term ‘speech sound disorder(s)’ is an umbrella heading under which there are several sub-categories that include articulation disorder, phonological disorder and childhood apraxia of speech. Speech sound disorder is sometimes called ‘speech impairment’ or 'speech difficulties'. There are several classification systems for speech sound disorders each with slightly different emphases and terms. Shriberg (2006) proposed three putative (generally supposed) causes of Speech Sound Disorder. There is a group that comprises children whose SSD may be due to a genetically based linguistic processing deficit. This group accounts for about 60% of children referred to SLPs/SLTs for help with their speech. There is a group of children with fluctuating conductive hearing loss associated with otitis media with effusion (‘glue ear’). The conductive hearing loss group accounts for about 30% of children referred for help with their speech intelligibility. There is overlap between the childrenin the first group and the children with compromised hearing in that a child might have glue ear and a linguistic processing deficit. The third and smallest group, comprising round about 10% of children referred because of their speech, represents a genetically transmitted deficit in speech motor control. In this group are the children with motor speech disorders including Childhood Apraxia of Speech and the Dysarthrias. Again, there may be overlap, with some children experiencing difficulties with motor speech control, and/or linguistic processing, and/or hearing. Do some children have more than one type of speech difficulty? Some children with speech sound disorders have more than one type of difficulty. In the same child with a SSD some errors may have a phonetic basis, some may have a phonological basis, or a perceptual basis, or a motoric basis, or a structural basis. What is a functional speech disorder? A functional speech disorder is a difficulty learning to make specific speech sounds. Children with just a few speech-sound difficulties at the phonetic level, such as lisping (e.g., saying 'th' in place of 's' and 'z'), or problems saying 'r', 'l' or 'th' are usually described as having functional speech disorders. But, you guessed it! There are synonyms for this too, including 'articulation disorder' and 'functional articulation disorder'. Functional speech disorders are often referred to as 'mild articulation disorders', 'functional articulation disorders' or ‘articulation disorders’. The trouble with the term ‘articulation disorder’ is that most children who are said to have ‘articulation disorders’ have nothing wrong with their articulators (tongue, lips, palate, etc). Rather, they have a functional difficulty at the phonetic level that makes it difficult for them to say the sounds they need for articulate speech. Does that mean there is no such thing as an articulation disorder? Strictly speaking the term ‘articulation disorder’ implies an actual difficulty with the motor act of articulating speech sounds, syllables, words, and so on. So really, the term 'articulation disorder' is a misnomer. Children with functional speech disorders do not have an articulatory difficulty per se, they just sound as though they do! On the other hand, children with Childhood Apraxia of Speech (CAS), (also known as Developmental Verbal Dyspraxia [DVD]) or a dysarthria have articulation disorders (or in contemporary terminology, motor speech disorders). Children with anatomical (structural) differences such as cleft lip and palate, tongue-tie or other craniofacial anomalies may also have articulation disorders. What are the characteristics of articulation disorders? The word ‘super’ pronounced as ‘thooper’. The word ‘zebra’ pronounced as ‘thebra’. The word ‘rivers’ pronounced as ‘wivvers’. The word ‘leave’ pronounced as ‘weave’. The word ‘thing’ pronounced as ‘fing’. The word ‘those’ pronounced as ‘vose’. NOTE: Some of these sound changes are acceptable in a number of English dialects. Are there different treatments for different disorders? Treatment principles vary from disorder to disorder. SLPs/SLTs usually employ a traditional articulation therapy (Van Riper, 1978) in working with children with articulation disorders, and children with other speech sound disorders who exhibit difficulties at the phonetic level. SLPs/SLTs usually employ an approach based on phonological principles (Grunwell, 1988; Stoel-Gammon & Dunn, 1985) in intervening with children with phonological disorders. SLPs/SLTs usually employ an approach based on the principles of motor learning (Caruso & Strand, 1999; Schmidt & Lee, 2000) in treating children with motor speech disorders (CAS/DVD or a dysarthria). What is traditional articulation therapy? There is no single definition of traditional articulation therapy. It is a term that is applied to a number of therapy approaches that focus on the motor aspects of speech production, with or without auditory discrimination training. Charles Van Riper (1905-1994) is the name most famously associated with the development of traditional articulation therapy. In essence, traditional articulation therapy involves behavioural techniques, focused on teaching children new sounds in place of error-sounds or omitted sounds, one at a time, and then gradually introducing them (the new sounds that is) into longer and longer utterances, and eventually into everyday conversational speech. This sequence that takes the child or adult from single sounds up to increasingly complex utterances is often referred to as a treatment hierarchy. Is traditional therapy still an acceptable form of treatment? Traditional therapy techniques, using the format outlined above, have withstood the test of time, and can still be very suitable for children with functional speech disorders. Phonological Disorders, also called ‘phonological disorder’ and ‘developmental phonological disorder’ (DPD), are a group of language disorders, whose cause is unclear, that affect children’s ability to develop easily understood speech by the time they are four years old. In some children, phonological disorder affects the ability to learn to read and spell. This is especially the case if they have very poor speech intelligibility when they start 'literacy instruction' about five and a half years of age and at the same time have difficulties with semantics and syntax. Phonological disorder alone, without semantic and syntactic difficulties, does not appear to predispose children to literacy difficulties. Are there other names for 'phonological disorders'? Phonological disorders are known by many synonyms including 'phonological disorder' and 'phonological delay', and 'phonological impairment'. Why do SLPs/SLTs call the same thing by different names? Bowen, C. (2010). When is a speech test not a speech test? Speech-Language Therapy terminology. Blenheim: Paper presented to the New Zealand Audiological Society Biennial Conference. Rector, A.L. (1999). Clinical terminology: why is it so hard? Methods of information in medicine,38(4-5), 239-252. Scarborough, H. S., & Brady, S. A. (2002). Toward a common terminology for talking about speech and reading: A glossary of the ‘phon’ words and some related terms. Journal of Literacy Research, 34, 299-334. Speech Pathology Australia. (2008). Criteria for the analysis of speech pathology terms: challenges and a methodology. Melbourne: Speech Pathology Australia. Walsh, R. (2006). Meaning and purpose: a conceptual model for speech pathology terminology. Advances in Speech-Language Pathology, 7(2), 56-76. Phonological processing disorder! Oh no! There are two terms that are not included in the list of synonyms. They are ‘phonological processing disorder’ and ‘phonological processes disorder’. Despite their wide usage, these incorrect (and misleading) terms are not synonyms for developmental phonological disorder. Neither are they names for closely related speech sound disorders. They are ‘made up’ terms that have somehow crept into listservs and discussions. Even SLPs/SLTs sometimes use them! Are phonological disorders something new? No, but the term phonological disorder reflects a paradigm shift (Grunwell, 1975; Ingram, 1974, 1976). Prior to this change in scholarly thought, a phonological disorder was termed an 'articulation disorder' or 'functional articulation disorder' (or going even further back, 'dyslalia'), and the relationship between it and learning basic school work (like reading and spelling) was not well recognised. Children were just thought to have difficulty in articulating the sounds of speech and traditional articulation therapy (Van Riper, 1978) was used to rectify the problem. Is 'phonological disorder' a new name for 'articulation disorder'? 'Phonological disorder' is not simply a new name for an old problem. The term reflects the influence of clinical phonology and psycholinguistic theory on the way speech-language pathologists / speech and language therapists now understand children's speech sound disorders. Nowadays, the traditional diagnostic classification of 'functional articulation disorder' is falling into disuse. Children with phonological disorder are usually able to use, or can be quickly taught to use, all the sounds needed for clear speech - thus demonstrating that they do not have a problem with articulation as such. In other words, we now know that the problem is not a motor speech disorder. To complicate matters, however, some children with phonological disorders also have difficulties with fine motor control and/or motor planning for speech. What are the speech characteristics of phonological disorders? Inconsistent Speech Disorder is a type of phonological disorder. Children with Inconsistent Speech Disorder have at least 40% of words produced variably (inconsistently) (Holm, Crosbie & Dodd, 2007). There are three types of inconsistency. One of them, “token-to-token inconsistency” is the defining characteristic of Inconsistent Speech Disorder. It is also one of the characteristics of some, but not all children diagnosed with Childhood Apraxia of Speech (CAS). Is traditional therapy OK for treating phonological disorders? The traditional approach is unsuitable for children with phonological disorders. 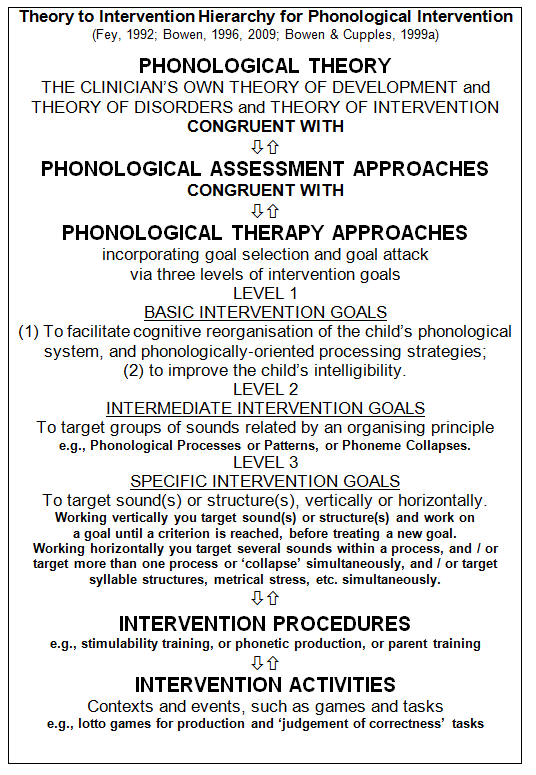 SLPs/SLTs who include phonological principles in their theory of intervention believe that a 'phonological approach' should be used with children with phonological disorders. has generalisation as its ultimate goal. Where does the problem (of phonological disorder) lie? In essence, the child with a phonological disorder has a language difficulty affecting their ability to learn and organise their speech sounds into a system of 'sound patterns' or 'sound contrasts'. The problem is at a linguistic level (i.e., the phonemic level) and there is no impairment to the child's larynx, lips, tongue, palate or jaw. Let's start with a reminder about what it is not! Childhood Apraxia of Speech (CAS) is a childhood speech disorder. It is not the same as ‘Apraxia’ or ‘Dyspraxia’ in adults who have had strokes or head injuries. Just repeating that sentence, but this time emphasising the word ‘speech’ rather than the word ‘childhood’, Childhood Apraxia of Speech (CAS) is a childhood speech disorder. It is not the same as ‘Developmental Coordination Disorder’ (formerly called 'clumsy child syndrome' by some authors) which is sometimes referred to as ‘Dyspraxia’. Childhood Apraxia of Speech (CAS) is the term preferred by the American Speech-Language Hearing Association (ASHA, 2007). CAS refers to apraxia of speech in children in all its manifestations whether the cause is unknown (idiopathic or functional) or known (organic). There is an important difference between the use of the term CAS in the US, referred to above, and the use of the term DVD in the UK. The UK term refers only to the idiopathic presentation (RCSLT, 2011). What is Developmental Verbal Dyspraxia? Again let's start with a reminder about what it is not! Developmental Verbal Dyspraxia (DVD) is a developmental or childhood speech disorder. It is not the same as ‘Apraxia’ or ‘Dyspraxia’ in adults who have had strokes or head injuries. Just repeating that sentence, but this time emphasising the word ‘verbal’ rather than the word ‘developmental’, Developmental Verbal Dyspraxia is a childhood speech disorder that usually sees affected children experiencing language difficulties as well. The use of the word 'verbal', 'reflects the impact not only on speech and prosody, but considers the potential impact on language and other communicative elements' (RCSLT, 2011). DVD is not the same as ‘Developmental Coordination Disorder’ which is sometimes referred to as ‘Dyspraxia’. As mentioned above, Developmental Verbal Dyspraxia (DVD) is the term preferred by the Royal College of Speech and Language Therapists (RCSLT). DVD refers to apraxia of speech in children in its idiopathic or functional presentation only. What are the characteristics of children with CAS? Do phonological disorder and CAS have similarities? There are missing vowels, missing consonants and missing syllable structures (e.g., no VC or CVC syllables). The child may be able to produce a particular speech sound or structure, but omits them when speaking. Consonants and vowels are produced incorrectly. Word stress, intonation, nasality, pitch and loudness may sound “odd” and are difficult for the child to regulate. The child makes more errors in connected speech than when saying single words, and also makes more errors with “complicated” words. Use of simple (but not complex) syllable and word shapes. Weak syllables are deleted (e.g., “disaw” for “dinosaur”), clusters are reduced (e.g., ”tin” for “twin”). Children with the various types of dysarthria have a neuromuscular impairment. That is, the speech mechanism (larynx, lips, tongue, palate and jaw) may be paralysed, weak or poorly co-ordinated. The dysarthrias can affect all motor speech processes: breathing, producing sounds in the larynx, articulation, resonance, and the 'prosody' or rhythm of speech. Can the various speech sound disorders co-occur? The disorders can co-occur, in varying degrees, in the same individual. For example, a child might have a severe phonological disorder with an element of CAS. Another child might have CAS with a mild dysarthria. Can SSDs occur with other communication disorders? Speech sound disorders can co-occur with other communication disorders such as language disorders, fluency disorders, voice disorders or pragmatic difficulties. Can I 'trust' the information about SSDs that I find on the Internet? There is a lot of information on the Internet relating to speech sound disorders. Some of it, for example much of the content on the Apraxia-Kids site, is helpful, authoritative and factual. Unfortunately, the same cannot be said about some of the other sites that are 'out there'. Be selective in what you take the time to read or print, and ask your child's SLP/SLT which sites they recommend. When you visit a site, check for yourself that the author has reliable credentials. In general, proceed with caution, because not everyone who claims to be a speech and language expert is! Help! This is all so new to me! If you are the parent of a child who is in the process of diagnosis, or who has recently been diagnosed with a speech sound disorder, get on with the therapy and try not to jump ahead in time, worrying about symptoms, problems and situations that may never arise for you and your child! And please be guided by the speech-language pathologist / speech and language therapist who knows your child, as he or she is the person who is most likely to be able to provide you with relevant answers and appropriate information.